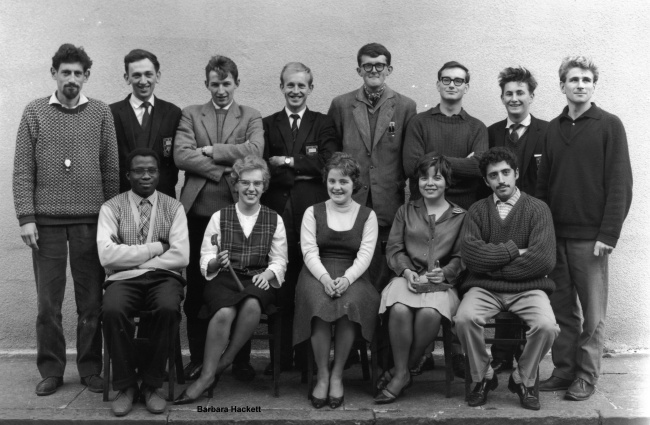 Barbara was born on 19th September 1942 in Dudley and attended Dudley Girls High School. She enjoyed many interests and hobbies. In her youth, this included the Girl Guides, cycling with her father as a member of the Cyclists’ Touring Club and, while at the University of Wales, sailing with the University of Aberystwyth Sailing Club. She loved to read and had a lifelong interest in history and geography. One story from her schooldays shows her wit ingenuity and humour. A school friend remembers Barbara at Dudley High School where the wearing of a navy blue beret was compulsory. The class were being marched up to church in full regalia. Barbara had forgotten her beret. As resourceful as ever, she folded up a pair of navy blue knickers and pinned them to her head in a jaunty style to resemble a beret. No one in authority noticed and she was spared a detention. In California she met and fell in love with David Alan Haner, whom she married in 1966. In 1968, she gave birth to Suzanne Elizabeth and eighteen months later, to Michelle Alison. Barbara and Dave have four grandchildren: Sarah, Elsa, Morgan and Emily. Further pursuing her studies in geology, Barbara gained a PhD from USC in 1982. After working as a university lecturer and holding various positions at Rancho Santa Ana Botanic Garden, she moved to a career in library science, obtaining her masters degree in library science from the University of California, Los Angeles (UCLA) in 1988. From 1988-1995, Barbara served as a Science Reference Librarian in the Physical Sciences Library at the University of California, Riverside. In 1995, she became UCLA’s Earth, Space and Atmospheric Sciences Librarian at the university’s Science and Engineering Library. As soon as she arrived at UCLA, Barbara began familiarizing herself with the faculty in her departments and their research and instructional specialties. She followed up her paper and internet investigations with personal visits to each faculty member in his or her office, forging close and mutually supportive relations that served her well until her retirement in 2002. She also attended the various Earth and Space Sciences and Institute for Geophysics and Planetary Physics seminars providing feedback and advice on additional resources to graduate students practicing their first professional presentations. In addition to developing and managing collections in her disciplines, she taught classes and served on the reference desk in the library. While with UCLA, she developed a website on mines and mining resources in southern California that became very popular with on- and off-campus mining enthusiasts. Barbara was also on the International Relations Committee, Best Reference Book Committee, and Sixth Union List of Geological Guidebooks Committee, as well as serving as the society’s first Press Officer. She was active in the Western Association of Map Libraries, serving as a Geological Editor and member of the Publications Committee. Barbara participated in numerous professional associations including the American Library Association, the Western Association of Map Librarians and the Geoscience Information Society. In 1994, while serving as Vice-President/President Elect, she planned the annual GIS meeting in Seattle, whose topic was “Changing Gateways: the impact of technology on geosciences information exchange. ‘Changing Gateways: The Impact of Technology on Geoscience Information Exchange’ edited by Jim O’Donnell and Barbara Haner. In preparation for her retirement in April 2002, Barbara completely revised her collection development policy statements. Her revised policy statements assisted the Head of Collection Development in making collection management decisions during 2003-04 and served as a invaluable training document for her replacement. The policy statements include information on the extent to which the Geology and EMS collections collect materials by topic, on cooperative collection policies with other universities and on the research and teaching interests of each faculty member in the departments. The announcement of her retirement in the USC Geology Alumni Newsletter included her best guess that: “I expect to be in Herefordshire, England in a black and white framed sixteenth century cottage in the village of Pencombe for six months of the year. We will be in the USA for the rest of the time but expect to be travelling as my husband Dave (also a USC alum), retired from teaching at Cal Poly Pomona, still does consulting for JPL including research on Hawaii.” Her regular trips back from California began in earnest after her mother died, as she sought to support and spend more time with her father. She pursued her interest in genealogy and local history, participating in the Bromyard & District Local History Society, and contributing to GENUKI, United Kingdom and Ireland Genealogy. She took part in historical surveys such as of the village of Pencombe and helped with the annual display for Bromyard and District Local History Society. She was Librarian at the Science and Engineering Library for almost 14 years before retiring in 2002. She still continued to work there during her winter visits to California. With her husband, she shared a passion for travel and the outdoors. In recent years, they visited Alaska, New Zealand, Japan, Machu Pichu and Tasmania. During the winter, Barbara skied with family in Bear Valley and, during the summer, she hiked with former Dudley Girl’s High schoolmates in England. Above all, Barbara loved spending time with her friends and family, showering her children and four grandchildren Sarah Elizabeth Scherzinger, Elsa Page Scherzinger, Morgan Albrecht Haskell and Emily Morgan Haskell with love, care and attention. Barbara joined Herefordshire and Worcestershire Earth Heritage Trust, the county geoconservation group, and participated in field work during her summer visits to Britain. She helped with the exploration for projects in the Frome and Arrow Valley. 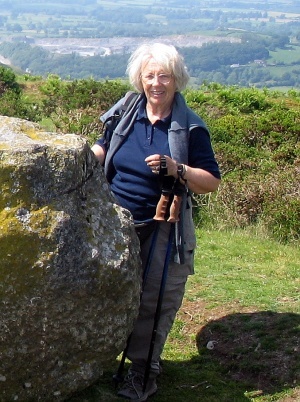 She contributed her geological knowledge to the audit of geological sites for the development of the Geodiversity Action Plan for Herefordshire. She attended the field weekend reunion of the Aberystwyth Geology Department in the ‘Footsteps of Nancy Kirk’ to Llandrindod Wells in 2008. She was always cheerful and full of energy. She was keen to help as much as she could and sent parcels of useful material such as papers, information about courses and a copy of William Smith’s geological map back from California to Herefordshire. She posted NASA posters to the Earth Heritage Trust and sent postcards of the Burgess Shales which she visited on its centenary. To help with projects, she sorted out photographs of geological features taken on walks. She was truly inspiring and spread her boundless enthusiasm. Early in 2010 Barbara was diagnosed with a stage 4 brain tumour and received chemotherapy and radiotherapy. Her daughters asked friends to send photos of Barbara for an album and this was presented to Barbara and Dave on their 44th wedding anniversary. Dave told the story of how he sat with Barbara on the patio at the Claremont Care Centre. Barbara said, “Dave, we maybe didn’t get everything right, but we sure got the vast majority of it right – don’t you think?” He replied, “The proof of the pudding is in the eating. We’ve been together for 44 years and never had the urge to look back.” Barbara died on 19th November 2010. She is greatly missed by all who knew her. We all remember her as vivacious and generous. A memorial service was held on December 5, 2010 at the Rancho Santa Ana Botanic Garden in Claremont. Also a celebration of the life of Barbara Haner was held on 22nd January 2011 in Herefordshire. The Reverend Chris Fletcher in his address said, “I am pleased to been invited to say something about Barbara – dear warm, loving energetic, and vital – wife, mom, grandmum, such a good friend and colleague. She endeared herself to so many and contributed so much to so many”.